The “city of Angels”, the great Thai capital is one of the few places in the world where you can find small village homes in between impressive skyscrapers and trendy shopping malls; hectic street markets overlooked by rooftop bars; peaceful temples surrounded by the noise of busy streets and canals. It’s the contradictions that make Bangkok such a fascinating city. For first-time solo travelers and visitors with limited time, here is my list of the top things to experience Bangkok’s multifaceted personality. One of the must-do things when in Bangkok is to visit a night market. This is a great way to mingle with the locals, try street food and practice the art of bargaining. One of my personal favorites is Rot Fai because 1) it’s easily accessible; 2) it has a very vibrant, local energy with slightly hipsterish vibe; 3) it offers an abundant food selection and a nice mix of vintage and trendy finds; 4) it’s very neat and organized (compared to other markets); 5) with its marquee rainbow-colored tents, it’s a photographer’s dream; 6) the prices are lower compared to other more tourist night markets. How to get there: Take the MRT to the Thailand Cultural Center stop and follow the crowds. TIP: When you buy a ticket at the automatic ticket booths, you will receive a little black token. This is your ticket! You’ll need it to enter and exit the MRT. If you are using a taxi or a tuk-tuk, agree on the price beforehand. A rule of thumb: when they quote a price, make a counter-offer, asking for half the price of what they suggested. It’s OK to agree on a price somewhere between their initial price and yours. Alternatively, use Grab taxi app (the Asian Uber). 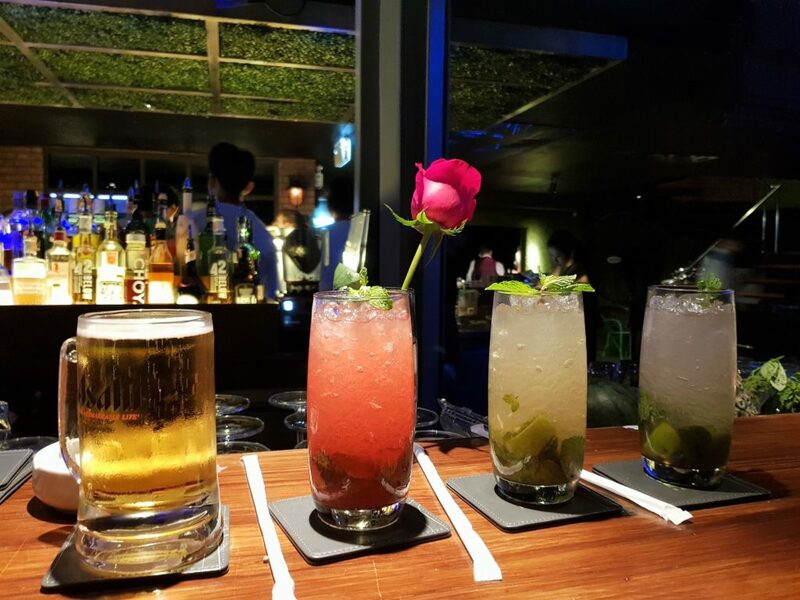 After you tantalized your tasting buds at the Ratchada Rot Fai Night Market, it’s time to unwind with a cocktail and a 180-degree panorama of Bangkok. I love this bar because it has a very vibrant atmosphere, great cocktails and really friendly staff. The music spans genres depending on the day of the week. If you’re lucky you might catch some live band playing. A good idea is to call or Facebook text them to check what music they’re playing the night of your visit and/or make a reservation. Hours: 6:00 p.m. to 2:00 a.m. Dress code: You won’t be allowed to enter if you wear flipflops or sneakers. Sleeveless shirts or open shoes are no-go for guys. This applies to any rooftop bar or upscale restaurant in Thailand. Other rooftop bars worth considering: Sky bar (the famous “Hangover” bar) with a great view over the river; Vertigo – Banyan Tree Bangkok – a bar 61 floors above the streets of Bangkok; Red Sky – Centara Grand at CentralWorld – one of the newest rooftops in Bangkok offering a 360-degree panorama view and very convenient location. Most of Bangkok’s ‘must-see’ sights are in and around the former royal district, Ko Ratanakosin. Start early and you’ll be able to cover the district in half a day. Be respectful and dress modestly. Wear clothes that cover your shoulders, knees, and feet (no tank tops, open shoes, short skirts, and shorts). While Thai Kings stopped living in the palace around the beginning of the 20th century, the Grand Palace remains the city’s most famous landmark. 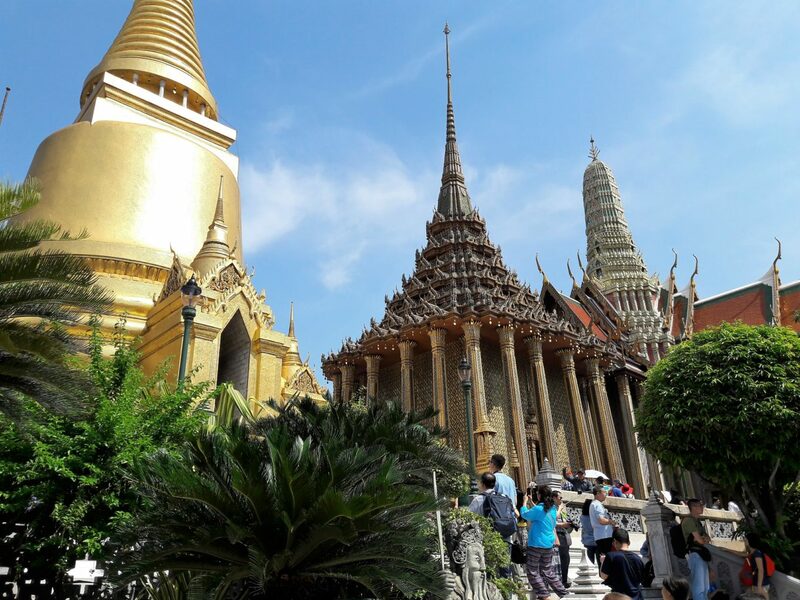 Within the palace complex are several impressive buildings including the Temple of the Emerald Buddha, which contains the small but greatly revered Emerald Buddha dating back to 14th century. 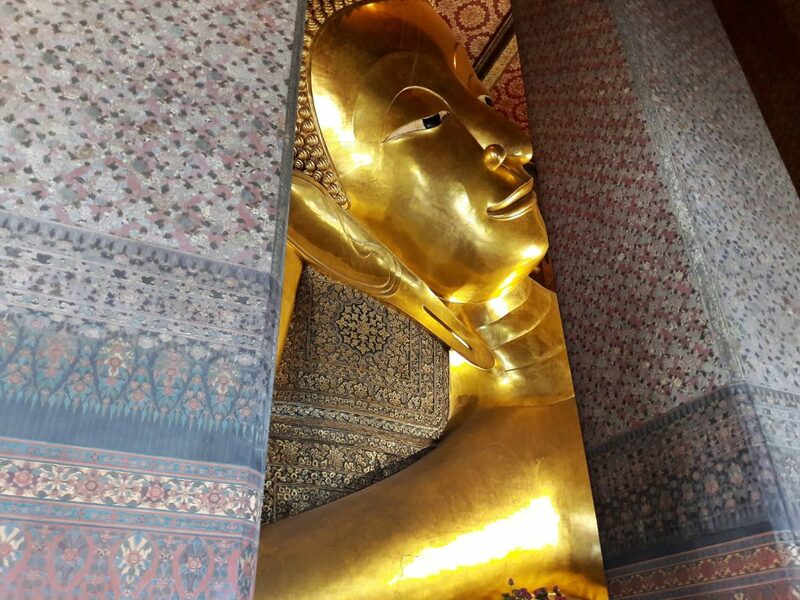 The main reason people visit Wat Pho is the giant reclining Buddha. Even though the 46-meter long statue covered in gold leaf representing Buddha during his last illness before entering the parinirvana (nirvana-after-death), is quite impressive, it’s the rest of the complex that makes it my favorite temple in Bangkok. Wandering around the 4 chapels and the 91 stupas (structures containing relics) decorated in colorful tiles standing next to bonsai trees is a quite relaxing experience. If you’ve never tried a traditional Thai massage, Wat Pho is a good place to do so as it’s considered the leading school of massage in Thailand. Wat Arun is almost directly opposite Wat Pho. 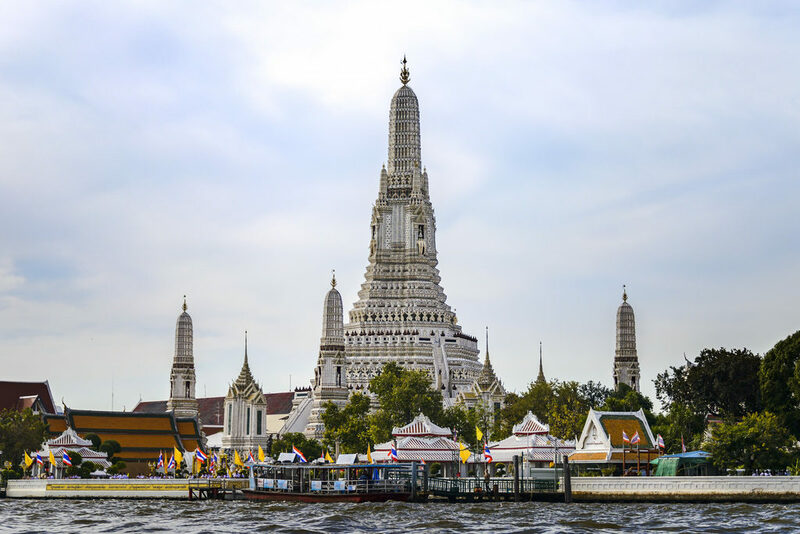 Beautifully decorated with tiny pieces of colored glass and Chinese porcelain, Wat Arun is considered by many as one of the most beautiful temples in Thailand. When you cross back the river to Tha Tian Pier, the Sixth is only a short walk from there. 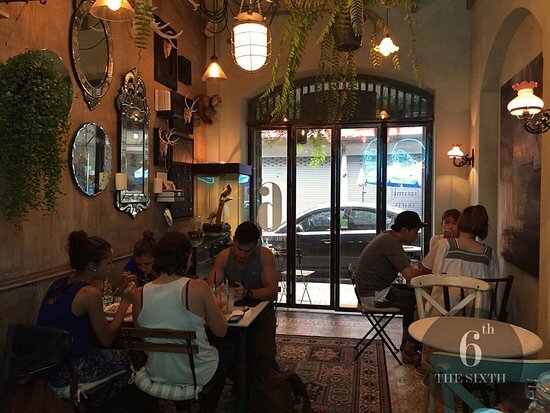 It’s a small place with about five tables, run by a Thai couple. Even though you might have to wait for a table, it is totally worth it. The food is absolutely delicious. If this is your first time in Thailand, you must absolutely try the Pad Thai, Thailand’s national dish. China Town Gate: An impressive gate signifying the loyalty of the Chinese community to King Bhumibol of Thailand. Wat Traimit Temple: Here you can see the largest gold Buddha statue in the world. Also, the view from the top offers a sight to the China Town Gate nearby. Sampalang Lane: Originally the high street of Chinatown when the Chinese community first moved here, this street is cluttered, chaotic, nerve-racking and … lots of fun. 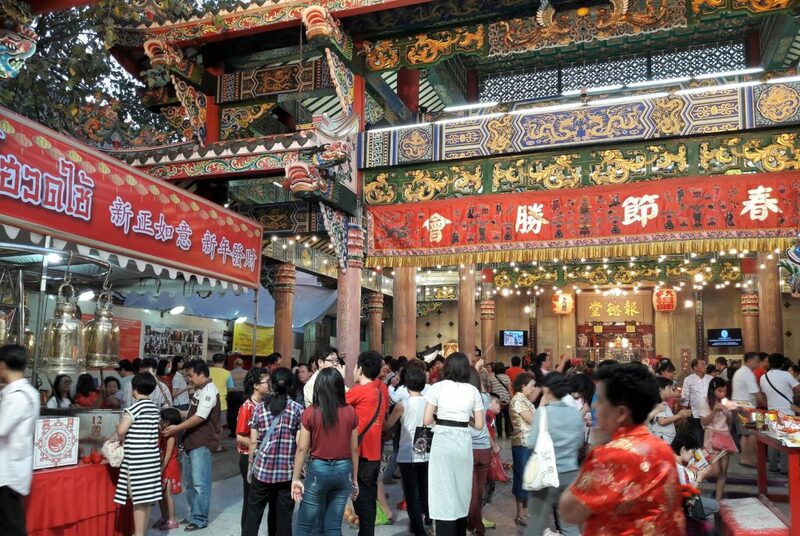 Wat Mangkol Kamalawat Temple: This is the largest Chinese-Buddhist temple. Yaowarat Road: The high street of Bangkok’s Chinatown and one of the best street food locations in the world. While Chinatown food scene mostly comes alive around sunset, you can still grab something to surprise your taste buds. If you’re into ice-cream, try my absolute favorite – homemade coconut ice-cream! If you happen to be in Bangkok during the Chinese New Year (Tuesday, February 5th, 2019), definitely visit the Chinatown as various events and small parades spread around it most of the day and evening. 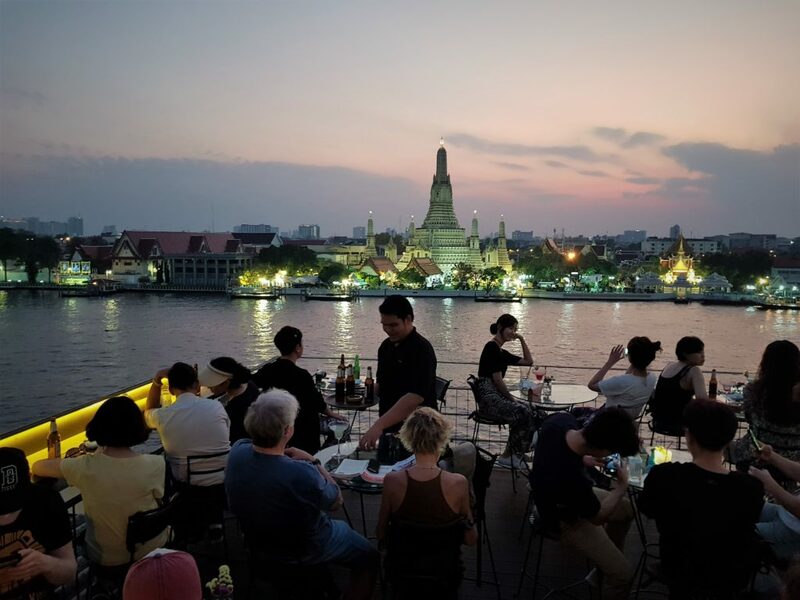 The Eagle Nest Bar is a hidden gem in Bangkok’s Old Town, where you can enjoy the sun setting behind Wat Arun temple. Also, take a peek behind you where you can partially see the lights illuminating the buildings of the Grand Palace and the spires on the ground of Wat Pho. The drinks and the service might not be perfect but you won’t notice as you will be fully immersed by the view. Hours: 5:00 p.m. to 00:00 a.m. TIP: If you are not very much into sugary cocktails, go for a local Thai beer. How to get there: When in the area, ask locals to point you to the entrance. It’s not easy to find. Remember, you need to walk up a few flights of stairs to get to the top. Best time to visit: if you want to enjoy the sunset, arrive no later than 5:30 p.m. While Khao San Road, “the center of the backpacking universe”, as the popular book “The Beach” described it, is not my cup of tea, it’s definitely a must-visit. The 1-km strip has a lot to offer: restaurants, coffee shops, bars offering cocktails in buckets, guesthouses and hotels, massage parlors, tattoo shops, guys selling fried scorpions and insects for the curious travelers to try and … I will stop right here as I don’t want to spoil it for you. 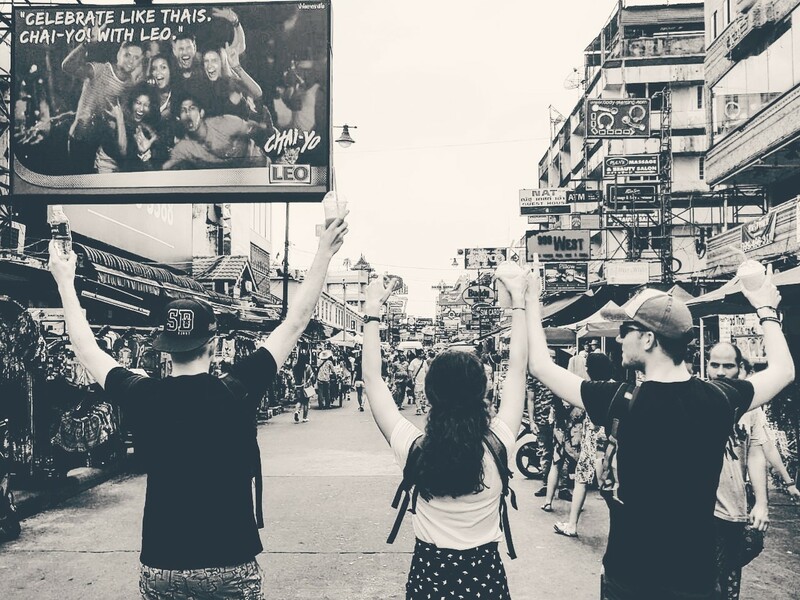 Khao San Road: you either love it or hate it, there’s no in between. 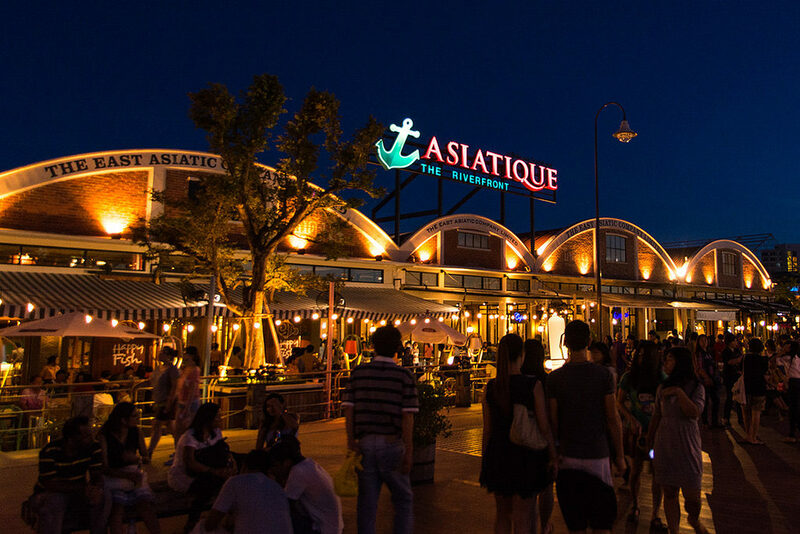 If you’re not completely exhausted by now, you can visit Asiatique Market before you call it a day. Besides small boutiques and trendy restaurants by the river, you can get a ticket to the famous Calypso ladyboy cabaret Show. While Asiatique can get crowded, it’s predominantly locals, who hang out there. How to get there: At No. 8 Tha Tian Pier, take the Chao Phraya Express Boat to Sathorn Central Pier (Saphan Taksin) where you can catch the free shuttle boat to Asiathique. Named after the birthplace of Buddha in Nepal, Lumpini Park is an inner-city forest park home to indigenous flora and some unusual residents like the water monitor lizards, which you can see walking around freely. 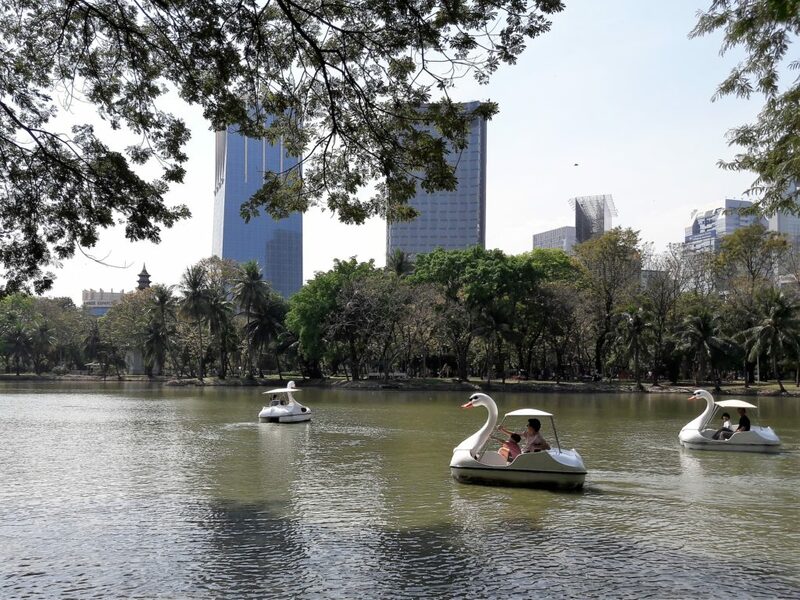 The park is a great place to hide from the scorching sun and enjoy a walk around the lake. If you’re visiting Bangkok between 23th and 27th January 2019, it’s absolutely worth it to visit the popular Thailand Tourism Festival in Lumpini Park. From 12:00 p.m. to 10:00 p.m. five ‘tourism villages’ will display the life in the different Thai regions – North, South, East, Central, and the Northeast. There will be processions, musical performances, and tasty treats from all over Thailand to try. Hours: 4:30 a.m. – 9:00 p.m. 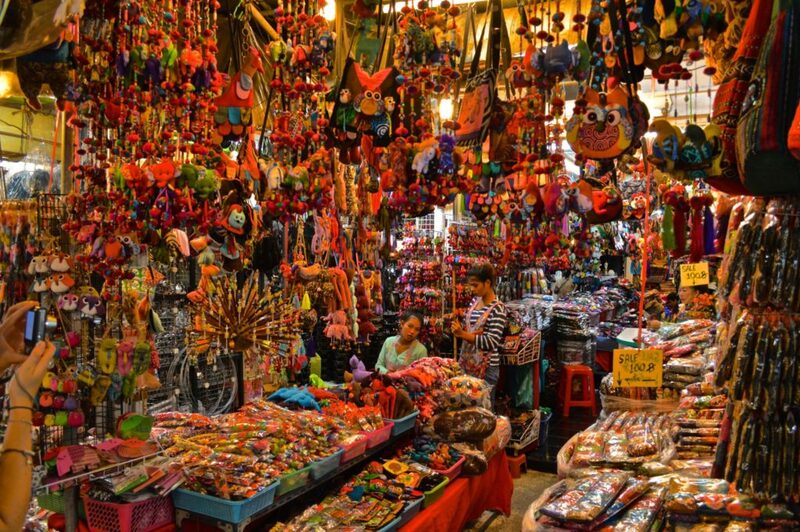 If you are in Bangkok during the weekend, squeeze half a day trip to the Chatuchak weekend market. 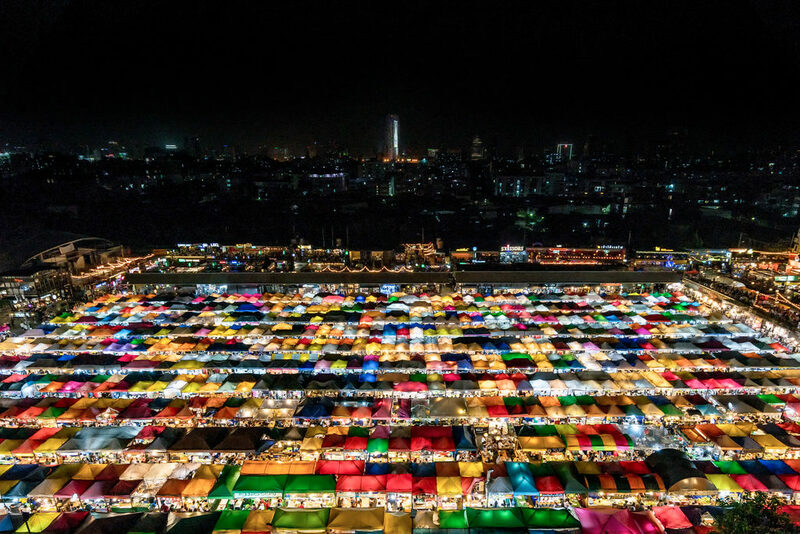 With its 8,000 market stalls offering just about everything, Chatuchak Weekend Market has reached a landmark status as a must-visit place for tourists. More details on how to navigate the Chatuchak weekend market here. However, if you are not much into shopping and/or you get overwhelmed by crowds, this might not be your place. 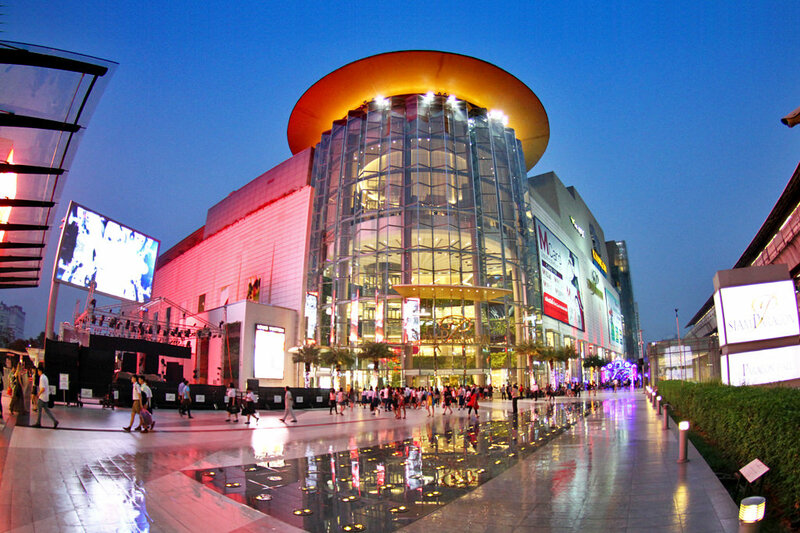 If you’re looking for some upscale, trendy, funky or more specialized products or you just want to check out some state-of-the-art architecture, Bangkok’s shopping malls are the perfect spot for that. While there are more than enough shopping malls in Bangkok, I recommend visiting Siam Parogan, Siam; Central World, Siam and MKB, Siam, as they are all located conveniently right next to each other. Hours: 09:00 a.m. – 10:00 p.m. Unless you’re a huge fan of the Khao San road, there’s no point in staying in Bangkok’s Old City as everything closes with the temples. I would recommend staying in the area around Lumpini Park. This way you’ll experience the pulsating nightlife as well as have easy access to the Skytrain and the airports.